Some coyote individuals compromise their reclusiveness and wariness when food is around: they are opportunists after all, and what comes easy they’ll latch onto. 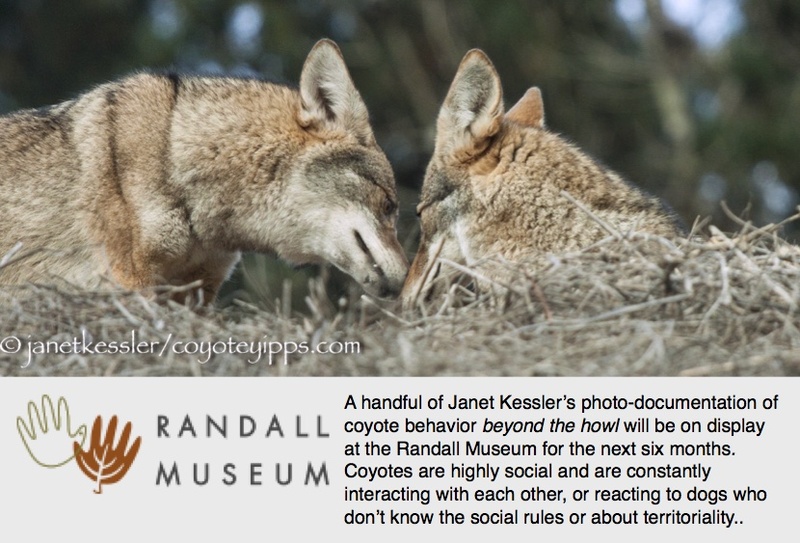 However, pups are not something they are willing to compromise for: pups are coyotes’ biggest kept secret. Two years ago, this coyote pair raised pups here in one of SF’s smaller parks. The coyotes had been tamed by feeders who not only fed them, but befriended them to the degree that the coyotes would wait around at the park entrance for handouts, as close as 5 feet or even less from people and their mostly leashed dogs. But unleashed dogs went chasing after the coyotes on a regular basis, making the coyotes very uncomfortable. The pups of course were kept totally secret, but I suppose dogs and people came close enough, often enough, to the secret den so that Mom decided she didn’t want to repeat the stressful experience. The pair played like youngsters at dusk, while the youngsters remained secretly hidden from dogs and people — this was in 2017, when few folks saw or knew about any pups in the area. Notwithstanding, the adults were pursued by dogs regularly. So last year these parents left that park for the duration of the pupping season, in spite of the plentiful supply of food there. They ended up raising their family at another, even smaller, but much more secluded location, where there were fewer dogs and fewer intrusive people. The problem with the new location was that it began being hugely developed and cleared for building purposes, and its diminished natural area became too small to accommodate the family. So at about the age of six months, the youngsters began navigating back and forth, at night, between this smaller location and the “feeding/dog” park, making it obvious that this family claimed both areas — about a mile apart. Theirs was what is known as a “fragmented” territory. But there at the old park, the number of incidents of unleashed dogs chasing and attacking coyotes grew, to the point of leaving coyote adults and pups with leg injuries. Some people felt entitled to not leash their dogs and went so far as to claim that the coyotes were playing with their dogs — that the coyotes “liked” being chased by dogs. In addition to the menacing dogs, other coyotes began appearing at that park in the middle of the night, so by the end of the year, we suddenly began to hear territorial fights between the resident coyotes and interloper coyotes at night. The territory would obviously not do as a pupping area for next year’s litter. A youngster urinates due to the stressful gaze of his father. Coyotes are wonderful parents, but harsh disciplinarians. This was the situation when, again, the coyotes picked up and left in January of this year. Their exit, as in the previous year, was orchestrated by Mom. For months before their departure, she was the one who went out each evening, traveling far and wide, mostly alone, but sometimes with her mate, surveying for a more suitable location for her next litter. When she found the right spot, she returned to gather her mate, and with one yearling in tow, off the trio went, traveling through some of the same open spaces they had been through the year before — spending about two weeks at several of these — before packing off to the next temporary 2-week place. The one yearling they brought with them. Finally, they settled down, a full 5 miles from their previous two pupping haunts, but still within the City of San Francisco. This is where it appears they will stay to have their pups this year, due in only a few weeks. Human fast-food toss-offs can be found even in this new location, but best of all: dogs are not an issue here since there aren’t any, and humans give them the respected space they need to live more natural lives. It’s not as easy as you might have imagined being an urban coyote. The runt in a litter, when there is one, is the smallest and sometimes the weakest pup. Their biggest disadvantage is that, because all the other pups are larger than them, they have a harder time competing for Mom’s milk. It turns out that getting one’s fair share of milk during the first 48 hours after birth is very important: only that very initial supply of milk contains colostrum which is loaded with antibodies which primes the pups’ immune systems, without which they could be more vulnerable to illnesses. In domestic dogs the runt may be ignored by the mother who focuses more on her healthier looking pups — it’s a form of natural selection. There is no reason to believe this is any different for coyotes, whose infant mortality rate is often 70% and more. Like father, like son! Size and age don’t matter when you itch! According to Dr. Margaret V. Root Kustritz, a veterinary theriogenologist (specializing in animal reproduction) the smaller size is due to their placement in the uterine horn during gestation — theirs is a poor implantation site. She says that small size is not due to being premature: all pups in a litter are fertilized at the same moment in time. So here is a little coyote runt whose small size compared to the rest of the litter really surprised me at first. It is about 2/3 the size of the others — a litter of all males! Cool! As I watched, this one was the only pup indulged by Dad — and he loved the attention when it came. As it turned out, none of the other pups — size notwithstanding — had anything over this particular runt. Although small, scrawny and with obvious skin issues, this one is the most active, most focused, most inquisitive of the bunch, and the only one, as I watched, who spent a great deal of time alone, honing his hunting skills, possibly imitating what he saw his parents do. It will be interesting to watch his development in relation to his siblings as they grow up. The whole pup clan lined up for me!